Caros, esta missão se pega na mesa das missões diárias da prefeitura da guarnição (não estou certo agora se precisa estar com ela no nível 3 ou não). Sempre tem uma missão pra fazer sozinho e uma missão mais difícil pra fazer em grupo. O Ataque ao Fosso é uma missão pra fazer em grupo. Só aparece 1 tipo de missão por dia, então pode ser necessário esperar uns dias até esta missão estar disponível. Obs: esta é a única missão para a conquista de voo em Draenor (Desbravamento de Draenor) que não pode ser comprada. Easy soloable even if it says it is a group quest. Fly in to the Iron docks flightpoint. Make sure to stay high up on the higher levels, if you venture down to the bottom you will probebly die faster than you have time to utter a weak "yelp"! There are ammunniton boxes and barrels scattered around the place, pick up so you have at least 30 ammunition, go to one of the cannons (not the launch ones, the suprise I felt when I was shot out into the middle of the packs instead of shooting at them was something I don't want to experience again). From the safety of the cannon see them orcs fall! Rinse and repeat. There are elite patrols even at the higher levels sometimes, so be aware where you step. Stealth past, or wait for them to pass. Should you have a group at hand, make sure to kill all rares, they drop more apexis crystals and gear, and contribute to the daily count. Kiting works if you don't have a tank. This doesn't have to be done in "just" a party of 5. It can be completed with a whole raid group. Goes a lot faster with 40 people killing stuff. Probably makes it easier to find a group aswell. Good luck and i hope these will give you some good idea on how to do it. - Have Added some of the "SOLO" Methods. - Will Increase in future with more about Group Method Rares and drops. Sinal de Fumaça do Bombardeio - 30x Caixa de Munição Extra-forte = Causes 35 Yard Wide AoE Effects at your given location. Estrela de Ferro - 20x Caixa de Munição Extra-forte = Roll away an iron star to crush the Iron Horde beneth it. Jaula de Prisioneiros de Ferro - Open Cages - 7% progress. Manual de Treinamento = adds 2% to progress. (its a Book). Note: Raid Groups wont benefit from using Mechanics or rescue Cages. - Raid benefits however still from "books" but mainly killing. Note: Iron Star, Bombardment Signal Flare - Can be found on most location within the Quarry. Avoid using "IRON TROOP LAUNCHER" = Sends the player into suicide positions. Or sends you safetly to the oposite side of "The Pit". - Primal Spirit is never garantied, a chance as bonus to gain. Can drop 620-630 Gear (Uncommon to Epic). Grants 6 to 40 gold. - Pick up an "Orange-firey" Crystal. - 5min Buff causes insane AoE effect. Edit: Updated the post mainly for SOLO suggestion purpose! Edit: Added "The Pit" Rares achivement, and corrected some information. Edit: Changed the Solo-tools to links and uploaded Photos to wowhead. Edit: Added another few Rares and it drop items. Edit: Added another solo mode "Open friendly trapped Caged people". You get this quest in your Garrison's Town Hall, at the War Map, which is on a table, and has a blue daily exclamation point. Fly to as far north and west in Gorgrond as you can get. There is a Flight Master at Iron Docks, pick this flight path up. When you get there join a standard group of five: tank, healer, three DPS. Use Group Finder, Premade Groups, Find Group, and Quests. There will be many groups. Be sure to bring some deoderant! This is a raid wide quest, even if it does not say so. Go to the group finder and select 'premade groups' -> 'custom'. You will most likely find several raidgroups for this quest. Join one and roam with them. To complete this quest, you must kill Orcs. Picking up ammunition will allow you to use the guns in the nearby area. Currently there seems to be a bug when grouping with a raid and you may not get credit for your kills in the guns. The best ones are the Iron Demolisher (costs 30 ammo) or the Iron Star(20). You can also burn small books which you can find in the area for 2% gain. You can do this quest as a raid, but Cristal Apexis and Espírito Primevo won't drop while in a raid group. 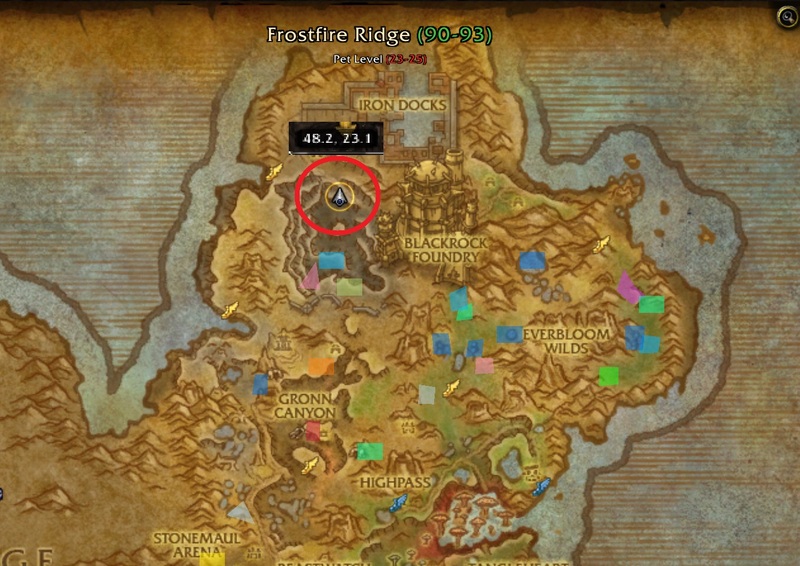 Contrary to what people in some raid groups will say, the Iron Horde at the bottom of the pit do count towards the 'total' - If anything, in a large raid it might be easier to farm the bottom since they respawn faster and there are much more of them. In my opinion I have found that this is the best and most efficient way to do O ataque ao Fosso and can be done solo which entails using a cart for 30 Caixa de Munição Extra-forte and throwing grenades at groups of Orcs in the canyon. Each cart trip should earn about 25% progress and last about 20 seconds but make sure you have Caixa de Munição Extra-forte which can be collected by right clicking on Caixa de Munição Extra-forte piles which are not hard to find, you will need 30 to operate the cart. Edit: Thanks mgibbonsjr for the feedback, I have updated the instructions to a step by step guide and added in coordinates for convenience! Also known as The PITA. Be very careful about stepping out of "The Pit". If you do you will lose all of your collected ammo. This is especially easy to do at the northwestern bridge. There is a large cannon here, a slope downwards and a bridge across. If you run up the slope and onto the bridge you have to cut it very close or you'll leave the pit area. You will also leave the Pit any time you move to the "upper" plateau. Are there any Alliance factions that we gain reputation with killing these guys? Location: Northern Gorgrond, to the west of Blackrock Foundry. Closest flightmaster is Faron Trilhapó. Pick up the ammunition in boxes and barrels and go to the Demolidor de Ferro (costs 30 ammo) or the Estrela de Ferro (costs 20 ammo) and shoot the Orcs. Do not go to the Lançador da Tropa de Ferro as it will shoot you. Destroying Manual de Treinamento or freeing prisoners in Jaula de Prisioneiros de Ferro also awards credit. The quest mobs hit pretty hard as they are intended for a 5-player group to defeat. Ninja groups abound. This has devolved into mostly ninja groups, which can be identified by the lack of Primal Spirit drops. They should drop by the dozens every minute. If they do not then the Group Leader is collecting them all. As I write this they are worth 50g each, at the AH on my server, after being converted to Savage Blood. Remember to bring your Bodyguard follower to this quest since, when you use the flare, the deaths count to increase the reputation with them. When you use the iron stars, or the cannons, you wont get reputation with them. I made a video soloing as tank this quest, and to make it easier, you can use the Burning Blade Crystal and Gronn Cannon. We all fell in the pi-eee-iittt! The non-elite Iron Laborers that are found all over the pit each count for about 1% per kill. However, most of the time they have an elite that patrols around them. The area I'm posting about has MANY Iron Laborers with NO elite patrol; and they respawn very, very quickly. Coordinates are around 48, 23. I will post a picture of the area on the map as well as a detailed photo of the spot I'm talking about. 2 things to keep in mind: Unless you have invisibility potions or spells, you may need to suicide yourself once to get down here initially (I found this spot by accident after falling off a nearby cliff). Once you get there, the orcs are very easy to kill and you should be able to hit 100% and hearth out in no time (depending on how many mobs your character is able to handle at once, of course). The other thing is that while there is no elite patrol near these mobs, there ARE elites "nearby", so just be mindful of your surroundings and try to always pull out of the way to the main corner (see second posted image for clarification). This is perhaps the only group daily apexis quest you'll need to do to get your Securing Draenor achievement, which is part of the meta achievement to get your Draenor flying. I completed this as a Beast Master Hunter. I recommend going to 48, 23 as Fruhauf suggested and stand where his second picture shows, near the dark area. Once there, I was able to clear out the dark area and then kill the Iron Laborers along the wall. When the Mechashredder 5000 was off cool down I would use that to quickly kill the Laborers. Make sure to watch for respawn which happens fairly quick. While time consuming to do it this way it worked for me since I prefer not to group for quests. Thanks to Fruhauf - this was exactly what I was looking for! I was able to complete this quest while doing Bonus Objectives at The Fel Forge/Ironhold Harbor in Tanaan Jungle. It seems the orcs there count toward this quest. Has one had the credit for this daily being taken while doing stuff in Tanaan Jungle. And then the achievement not satisfied for the assaults requirement to fly. I managed to do this quest all by myself. The trick is to only kill the small miners and avoiding the big ones. As a night elf druid I can go into Prowl on Cat Form and Shadowmeld when a big ones finds me and I am desperate. I am still able to get lots of ammo to do side objectives. Only took me around 25 min to go from 0% to 100%. This quest can only be picked up on the table in your garrison. The content change each day so if you need this for your meta Dominando Draenor and you can't pick it, you will have to wait till another day. With all due respect to the designers, this is the worst of the quests needed for flying in Draenor. It's sort of like spending a long August weekend in Newark after your car broke down and everybody is in a bad mood. Right, I know that's normal in Newark but this is like normal on steroids. Because you won't be able to find a group easily, you can spend hours wandering across realms and other parts of cyberspace looking for partners or you can just take a different approach: this is like a 10,000G fee for a rare mount. There is no direct cost for flying in Draenor....other than your repair bills. So be prepared to die a lot. If you are a squishy, go to Burning Man for the weekend and let the DK do it. The flying is worth it and as far as that sarcastic laughter from Irvine goes....well, you keep paying the bill, right? So do I. Forgot to mention more thing: if you're a Nelf, Shadowmeld doesn't work there. Working as intended? Who knows? Is it just me or is it retarded that Blizz would make a group quest that can't be shared? "You want Draenor flying when patch 6.2.2 goes live? Well too bad. We don't care. We could have added a missive for this assault, but we'd rather you'd have to wait for two weeks to get the quest, instead." Don't make the mistake I made ... Patch came out and this quest was all I had left .. I accepted the quest and went to the location to solo it ... then was called out to work ... came back next day and quest was gone ... you get the quest finish it then ... I will be waiting each day for it to pop again ... anyone know how many days it takes to come back in rotation? Just did this solo...super easy. Find a spot with lots of laborers (lvl 100) Jump in your shredder and mow them down. Super fast re spawn time. Happy flying from here on in! Had grouped up in a raid in grp finder...can not be done. Need to be in party or solo. Good luck! I love WOW. I live in Azeroth when I'm not actually trying to exist in the real world. But what irritates me more than anything else is when the numbers lie. If I'm a 100 Feral, a level 29 Elite shouldn't be able to one-shot me. If I'm a 100 Feral, a level 101 Rare shouldn't be able to 2-shot me. Oh yeah, there are a few surprises because that's what it's all about, right? Thanks but I have enough unpleasant surprises in the real world to last me for a lifetime. I go to Azeroth because it's a place where there aren't a lot of unpleasant surprises. We know what the rules are. If there are no more rules, fine. Just tell us. How hard could that be? You guys live in the real world too, right? This quest is the only thing standing in the way of me having flight on Draenor. 11, 12 days now. Not once has it appeared. Naturally, it's shown up twice on my alt who doesn't have the rest of the achievement done. Basing something like flight off of an RNG mechanic like this, I don't know, seems criminally stupid to me. Anyone have the home address of the dev team member responsible? I just wanna chat, honest. Here is another way to easily solo this quest.Ride along the northern slop (47.3,19.8) to the ramp (50.8,22.8).You might have to kill the patrolling irontusk trampler.Once there,kill the approaching iron laborers and pick up their crates.Walk down the ramp,keeping to the right,picking up everything on the way until you reach the lone laborer sitting in front of his tent.Kill him , walk back up the ramp and wait for the laborers to respawn.Once you have a 100 ammo stealth down to the iron turrets(49.3,21.7) and shoot away. Look for the Elite mob - Irontusk Trampler - he's a big mammoth type beast pulling two ammo crates. Fly up to him until u aggro him. Immediately fly away - he then carries on walking away but leaves the crates of ammo for u to pick up risk free ! I am going to comment on this quest from a solo perspective. This quest takes place in Gorgond. The Pit is a pit (literally), a quarry, immediately left of the Blackrock Foundry on the map. The nearest flight point is Skysea Ridge but you can also fly to Iron Docks. The mobs are mostly level 100-102 Elites with HP of about 400K-700K. Some of them hit really hard and are also casters, doing a lot of magic damage. As a Paladin tank ilvl 675 it is very hard to solo 2-3 of these Elites at the same time, depending, the Hulking Brute for example took tiome to kill and had to use some cooldowns. I presume that with similar level gear it would be very hard/impossible without a tank and a DPS and/or healer. One technique is to approach from the North West, from the Iron Docks flight point, and there you will see a number of elites in front of you, you could pick them out one at a time, very carefully so uyou do not pull more than one by mistake. It may take a long time, but if you can kill one on your own then it might be a reliable solution. Another technique is the one mentioned here by Shamazon. He describes getting in from a break in the wall at the South, then making your way to 47.20, 29.80. That is the location of a mining cart which you can get into, and it then rolls downhill on its rails, and while it's moving you can throw grenades at a numbner of mobs at the bottom of the pit, thereby scoring points. You would need to pick up ammunition before entering the cart, at least 30 ammo, or it won't let you. You can pick up ammo here and there, and there is a counter bar at the bottom of your screen showing how much ammo you are carrying. After the cart has reached its stop, you get thrown out, but right in front you and slihghtly up there is a Troop Launcher cannon, which you get into and launch yourself back up to the cart. Then you repeat the process until you have 100%. There are serious problems with that technique and I will describe here what you will face and the easiest solution! Your target location is the cart at 47.20, 29.80. To get there you can run, aggro an army of elites, you may then be able to go invisible, shadowmeld, stealth - or even die and then run back to your corpse. If you have Tom Tom you need to mark this location so it is clear on your screen and on the map. You will have to visit this location a few times. Once you are at the cart, by location 47.20, 29.80, you need to collect at least 30 ammo, or it will not let you run the cart. Ammo is available around you in buckets, boxes and on palletes etc, all around the cart. Some of the ammo is guarded by non-elites which you can carefully kill without pulling the other elites that are around. You then get into the cart and it starts rolling downhill, pretty quickly, you will have to press 1 for launching grenades into the mobs right at the bottom of the hill, you will need to be really quick to get out as many shots as possible before the cart reaches its stops. Now you need to get back up into the cart and repeat until you have completed the quest. The previous technique described asks you to get into the Iron Troop Launcher that is right ahead of you and launch yourself back up. This is very hard to get right and you can find yourself somewhere at random with plenty of Elites to go past to get back to the cart. The easiest and simplest solution is get on yuour mount, or runm whatever and follow the tracks back up to the cart. Doh! But remember to stay on the tracks as they bridge over gaps on the rock and you might fall otherwise. So get on your mount and follow the tracks back up to where you started from. Remember to look out for more ammo - there is a large crate right where the cart stopped - next to the Iron Troop Launcher that we will not use to get back up. Please upvote this post because it is dead easy to complete the quest this way and it may be helpful to others. One thing to note is, anything you kill in the area gives you quest credit, so it might take awhile, but you could simply solo a couple at a time till you eventually get 100%. What I did was go past the cart mentioned in other posts, head down the tracks, pick up a flare and shoot that into the mobs, then continue to the point where the cart ends. There's one elite there, and after you kill it, a doomroller or something forget the name exactly. You need bombs to power it. You get in it and start it and it ejects you, then rolls down the hill and mows down lots of orcs. You can't direct it tho. But it will respawn quickly, like in a minute or two, and if you have more bombs to power it, send it off again. There are a few of these in various places in the pit. To get back to a safer area, use the launcher, but I was not able to aim it, except up or down. So aimed the highest, launched, then when I was high up, used a Goblin Glider to sail to the rim. On the rim above the village area are some elephants dragging sacks of bombs, fairly easy to kill. And grunts with small boxes of bombs that go to and fro, so you don't need to brave all those elites in the village to get bombs. I was able to solo in an hour or so, but am an I-level 700 Hunter. I just Ran Back And Forth killing the lvl 100 laborers till i was at 100 percent! Tried to solo this with a 110 lock full cleared all mobs just using my void walker and aoe...cleared everything twice no completion...did blizzard patch this so its not soloable ?